Latin Name: Dianthus plumarius hyb. PPAF. A beautiful new garden pink from the renowned Whetman’s Pinks in England, Georgia Peach Pie has luscious peach hued flowers with a ring of raspberry surrounding an apricot eye. 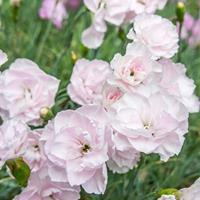 A modern variety with all the spicy fragrance of antique pinks, it has a long bloom period and reblooms in fall. Site in an open sunny site with well-drained, alkaline, even gravely soils or grow in containers to enjoy the sweet clove perfume up close. Set in the ground in spring when there is still the possibility for a light frost. It can also be planted in early autumn. Watering Details: Water regularly during first growing season, about 1" per week. Once established, only needs water during especially prolonged dry periods. Plant: Mounds of silvery, grass-like foliage. Flowering: Ruffles of light-pink surrounding coral-striped centers, atop the foliage. Seeds: Flowers will turn into brown seed capsules containing small black seeds, pointed on one end. May not come true to type. 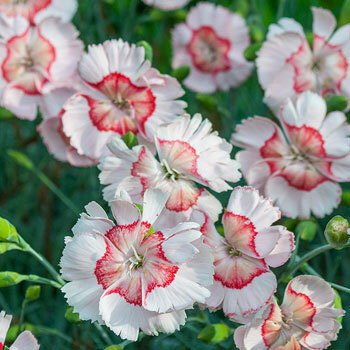 The name "pinks" is in reference to the fringed flower petals, which look as though they have been cut with pinking shears, which have a serrated blade and are used to cut fabric in a zigzag pattern in an effort to prevent fraying.